Copyright 2015 The Authors-Licenced under Creative Commons CC BY license. (http://creativecommons.org/licenses/by/4.0/). Shifts in species’ ranges are one of the most frequently reported and globally ubiquitous impacts of climate change, with rates of movement being particularly high in the sea. The arrival of multiple range extending species can cause serious issues for natural resource managers; some species threaten ecosystem function while others present social and/or economic opportunities. An early indication of which species are potentially extending their ranges can provide useful guidance for managers regarding future investments in impact assessment, monitoring or potential management intervention. Given that scientific monitoring data on potential range shifting species are often sparse in the marine environment a rapid assessment that utilises and assimilates disparate data sources that vary in quality, quantity and collection methods is needed. Off the east coast of Tasmania surface waters have been warming at almost four times the global average and dozens of species range shifts have already been documented. Building on existing methods used in the early detection of invasive species, we developed a cost-effective and rapid screening assessment tool that uses monitoring data from a variety of sources, particularly from the citizen science program Redmap, to classify levels of confidence in potential range extensions over a three year time period (2009–2012) for a variety of marine species. 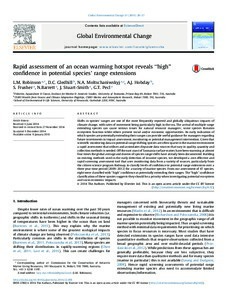 From our assessment of 47 species, eight were classified with "high" confidence as potentially extending their ranges. The "high" confidence classification of these species suggests they should be a priority when investigating potential ecosystem and socio-economic impacts.